We had a chat to bassist Brian Cook from Post-rock/Instrumental/Atmospheric Sludge Metal group Russian Circles. They’ve toured with bands such as Tool and Minus the Bear, and are heading to our sunny shores this April and May. Having just released a killer new album last year, Memorial, things are looking good for the Chicago lads. 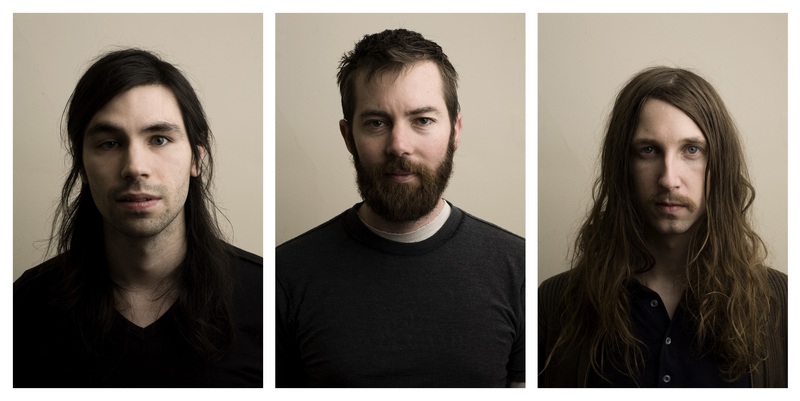 What’s been happening in the Russian Circles camp lately? Well right now we’re in the middle of a US tour, we’ve been out for about three weeks and we’ve got about another 3 weeks left, so this is our first day off in a while. I think for this tour… well, it’s winter here so it’s been pretty brutally cold, and there were some less than ideal weather situations. But yeah, it’s been good. We’re about to head west into warmer climates, so I think we’re all pretty excited. Well you guys are set for Australia in April and May, so I guess that will be pretty different. What’s your experience with Australia in the past? This will be our third time there. The first time we came over it was it was definitely a time of question marks because we’d never been there and didn’t really have any idea of what our fan-base in Australia was like. We went over and really filled our schedule as much as we could for the two and half weeks we were there. We really kind of exhausted ourselves playing four shows in Melbourne and cramming in stores and DJ sets and things like that. It was fun and went down really well and it was a really crazy positive experience in terms of being able to play in front of all these new audiences. But there wasn’t a whole lot of downtime to hang out in the cities, and one of the fun parts about touring is that you get to explore and sort of experience different cultures and enjoy the sights a little bit. We are on a bit more of a relaxed schedule this time so I’m really excited to just be able to take things in more. So you’re touring off the back of the new album from last year, Memorial. Given the reception that Empros received, what was your attitude towards making an album this time around? I think we all sort of surprised by how well Empros went over. With Geneva, the record prior to Empros, we did that in Electrical Audio which is a studio here in Chicago. It’s just an amazing professional studio. We had strings and horns and all this additional instrumentation that we brought people on board to do, so it felt like this very elaborate and lush record. Then we went and did Empros. That record was sort of difficult in a lot of ways, because it’s a lot less refined and lot dirty; it’s a little bit more low fidelity. We went into making that record knowing that that was the case, but in a lot ways it was difficult to deliberately scale back. If you’re trying to make a record that’s more abrasive and noisy but still has an element of beauty in it it gets a little tricky to discern good noise from bad noise. So I think with Empros we were really happy with the songs and also we were happy with it as a record, but getting it to the point where everyone felt good with it was really kind of a struggle and a lot of work. There was some doubt with that record, but at the end of the day we made the record we wanted to make. And people responded to it really positively. So when it came time to do Memorial, we went back to Electrical Audio and we went into the studio with a lot more confidence and came out with a lot more confidence. There’s always the critical reception or the audience perception in the back of your mind when you’re making a record. But I think just in terms of satisfying ourselves it was a much more successful record. It was much more of what we wanted to achieve than what happened with Empros. So if people don’t respond to it favorly, then that’s kind of their issue. [laughs] But I think it takes a bit of pressure off! You guys have some pretty different unique and different song names; can you give me some kind of idea where some of those come from? Well they’re usually references to various specific things. They don’t necessarily have a lot of symbolic weight; we usually don’t like titles about a backstory because usually a backstory isn’t that interesting and it doesn’t really lend itself to anything to do with the song. Also like a place-marker for us where it’s like, we wrote this song in 2009, in the spring, in this location and so we will use that location as the song name. And it’s kind of simple and bad. So I guess there’s always a little bit of phonetic attribute to a name. For example, we wouldn’t name a song “Cheyenne” if it didn’t have some sort of poetic quality to it. But also with Cheyenne being the capital of Wyoming, it isn’t really all that relevant to what the song represents. So most of the names are just an afterthought for us and don’t really have much symbolic weight. They are mainly just chosen for our own personal reasons. How does a Russian Circles song come into existence? Does one of you guys write down a riff or a groove or you do all jam it out? How do you start from nothing? Well Mike and Dave live in Chicago and I live in New York for the time being, so we are never really all in one city at the same time. At times we’ve all lived in different cities from each other. But when it comes to song writing it’s usually Mike writing a heap of riffs or sections and recording them then sending them off to me and Dave. Then we listen to them over and over again and wrap our heads around them. Mike and Dave will join up and try out Mike’s ideas that were most favorably received. After that they send me the demos, I’ll work on them a bit and eventually I’ll go back to Chicago and practice with them. Then we will change everything and it turns into an entirely different song and when we go into the studio and it changes all over again. By the time we’ve recorded the songs and we go on tour to play them live, they are completely different than how they originally were. At every step there’s a change involved, so it’s an ongoing evolution. On the topic of live performances, you guys are pretty renowned for your ability to recreate and expand on the sound of the album in a live performance. How important is it for you to bring the same energy and atmosphere in a live gig as there is on the record? I think it’s very important. Because, you know, a lot of those early rock bands were about making a record and then tour and go out to promote the record. But I feel now it’s really more about the live experience. I think if you can somehow capture the essence and the mood of what you do live on the record then that’s really cool but if you’re not a compelling live band then I think it’s almost misleading when you are making a record. But that way of thinking is not how rock music started out and it’s actually the opposite. I think for us we’re more into being a really good live band and we want to create an environment and atmosphere when we play live that people can kinda get lost in. The challenge is really figuring out how to put that onto a piece of vinyl and have that translate. Most people would agree that being an instrumental band is a pretty hard thing to pull off, not to mention make a living on. How do you keep it interesting without becoming too “single instrument” focused and instead create music where the focus is the collective effort of all instruments working together? I don’t really know, I think we’re always trying to find that balance. My experience from being in bands prior to Russian Circles and being in bands with vocals is that instrumentation always came first anyway unless you’re in a very pop singer/songwriter kind of mind frame. Most rock music is written around beats and guitar hooks and what not. It means that the final piece of the puzzle is never really put into place in terms of vocals. I think a lot of the time vocals are a distraction for people. It becomes a focal point that can either enhance your experience or detract from it. So we’ve just eliminated that variable. We’re all sort of curious music fans ourselves so we’re always trying to find new kinds of music that are interesting and exciting to us, but we’ve also old fans of Fugazi and early Metallica and that kind of stuff. I think most of what we do musically is long the same lines of what bands like that were doing. Whether it’s very heavy, riff based music or writing more sort of cerebral but still very visceral and physical rock music, we just cut out the final piece.